Scott Sports has announced that it is moving its sales division management and its showroom to Salt Lake City, though several core departments will continue to operate out of the company’s corporate headquarters in Ketchum. However, he said the company will maintain its Ketchum offices. “A lot of the operations, including customer service, accounting and things like that, will remain here,” Morton said. Montgomery said the information technology, marketing, customer service and art departments will remain in Ketchum. Montgomery said it’s important to the company to keep it associated with the Sun Valley brand. “Scott was founded in Sun Valley and part of our brand identity is that the company is based in Sun Valley, but it definitely comes at a cost,” he said. 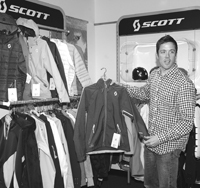 Scott Sports manufactures and sells equipment for winter sports, cycling, motor sports and running. The company’s founder, Edward Scott, is known for inventing the aluminum ski pole, in 1958. Morton said the company has had a presence in Sun Valley since then, except between 1979 and 1981, when it moved to Clearfield, Utah. “We’re absolutely committed to keeping the core operation of the company in Sun Valley. Morton said the company is moving its sales management department and showroom to Salt Lake City mostly due to the expense, difficulty and unpredictability of traveling in and out of the Sun Valley area. “You almost have to add extra days to your trip just in case you can’t get in or out,” he said. Montgomery said it’s too hard to get enough people in and out of Sun Valley to make it worthwhile to do effective presentations out of the current showroom. According to Morton, Scott currently employs 52 people in Sun Valley and 87 in Utah, mainly in Ogden, where the company’s manufacturing and distribution centers are based. He said the company already has two sales managers working out of Utah. However, Morton said most of the employees now working out of Sun Valley can stay put if they like. Morton said the company hasn’t established a concrete date for when the transition will be completed, but he did say it’s looking at some buildings in the Salt Lake City area.